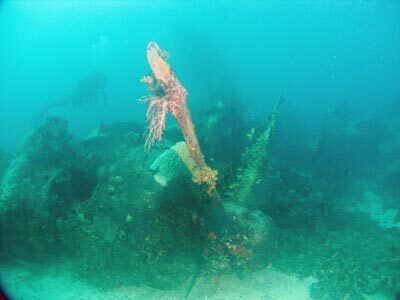 Michael McFadyen's Scuba Diving - "Emily" Flying Boat Kawanishi Kokuki Kabushiki Kaisha (The Kawanishi Aircraft Company Limited) was established in November 1928 with its factory being located at Naruo Mukogun Hyogoken near Kobe. During the war it built four types of sea planes, two very large planes and two small fighters. It also built a land based derivative of one of the fighters. 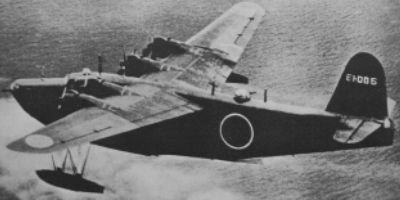 Before World War II, Kawanishi had an association with Short Brothers of Belfast (builders of magnificient flying boats like the Sunderland/ Sandringham) but their first large flying boat, the H6K Mavis was based more on the Sikorsky S.42. In 1938 the Imperial Japanese Navy issued specifications for a new flying boat that was 30% faster and with a 50% greater range than the Mavis. As a result, Kawanishi came up with a proposal for the H8K Emily flying boat. It was reported as being the single biggest leap in flying boat design and other manufacturers did not catch up to the design till after the war was over. The Kawanishi H8K Emily flying boat is now universally recognised as the finest flying boat of World War II. The Japanese designation was Type 2 Flying-boat, Model 12. The plane was huge, with a wingspan of almost 125 feet and a length of over 92 feet. The Emily was an all aluminium high-wing aircraft with a deep fuselage. It had four engines and the plane was stablised on water by two large, fixed stabilising floats. The production Kawanishi H8K1 was powered by four 1,530 hp Mitsubishi Kasei 12 14 cylinder radial engines driving a four bladed Hamiliton type constant speed prop. Maximum speed was 433 km/h with a cruising speed of 296 km/h. Service ceiling was 8,540 metres (28,000 feet) and it had a range of either 4,800 km, 6,257 km or 7,200 km (I have seen all these figures). It had a maximum take off weight of 30,870 kg (although I have read 24,500 kg). Normal crew was ten. There were 14 or 17 H8K1 built. The next version was the H8K2 and this was powered by four 1,850 hp Mitsubishi MK4Q Kasei 22 14 cylinder radial engines Maximum speed was 466 km/h with a cruising speed of 296 km/h. There were 114 built from 1943 to 1945. Two H8K3 prototypes were built in 1944 (similar to H8K2) and two H8K4 prototypes modified from H8K3 frames in 1945. There were also 36 H8K2-L transports built from 1943 to 1945. They carried up to 64 passengers. Only a total of 165 or 167 Emilys were built. The Emily was nicknamed "The Flying Porcupine" due to its heavy armament of five 20 mm guns and four 7.7 mm guns. The H8K2 had a bow turret with a single 20 mm type 99 model 1 cannon, a dorsel turret also with a single 20 mm type 99 model 1 cannon and a tail turret again with a single 20 mm type 99 model 1 cannon. In the cockpit hatch there was a single 7.7 mm machine gun and each side hatch had a single 7.7 mm machine gun. There was another single 7.7 mm machine gun in the ventral hatch. Finally, there were single 20 mm type 99 model 1 cannons in beam blisters. Offensive weapons, carried under the wings, consisted of either two 1,764 lb aerial torpedoes or eight 551 lb bombs or depth charges. The Emily was mostly used for bombing and reconnaissance purposes and sometimes transport. 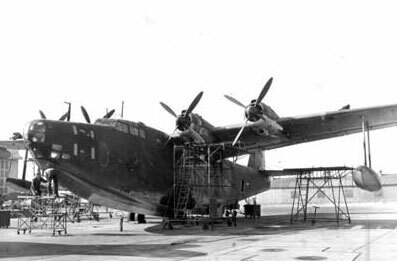 This plane was much larger and powerful than such famous planes as the British Short Sunderland flying boat (similar to the Qantas Sandringham in Port Vila Harbour) and the Boeing B-17E Flying Fortress (north-west of Honiara) which had wingspans of almost 115 feet and over 103 feet respectively and take off weights of 26,332 kg and 27,240 kg. Both were powered by four 1,200 hp engines. The plane is believed to have had its first combat outing during an attack on Oahu, Hawaii, on the night of March 4-5, 1942. This was the second attack on Pearl Harbor. In late July 1942 Kawanishi H8K1 Emilys were responsible for three attacks on Townsville in Queensland. On the night of 25/26 July two Emilys bombed Townsville port but the bombs fell wide of the mark and landed on mudflats. The planes, W-45 and W-46, were not intercepted and no anti-aircraft guns fired on them. On 27 July one Emily was attacked a it flew over Townsville and it dropped seven of its eight bombs on the Many Peaks Range. This aircraft was W-46. The third and last raid was on the night of 27-28 July when two Emilys (W-37 and W-47) left their base (I am not sure where this was yet) but W-37 had engine problems and turned around. 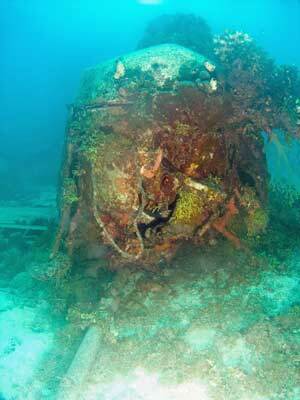 The remaining plane continued and was attacked by Bell P-39 Aerocobras between Magnetic Island and the mainland. The Japanese plane dropped its bombs and they hit the mud below (one remained in the plane). During the attack by two Aerocobras, the bomb fell out of the bomb bay and hit the ground destroying a palm tree. Cannon fire from the fighters exploded in the rear gunner's compartment. The planes continued their attack until they ran out of ammunition. The Emily made it safely back to base. 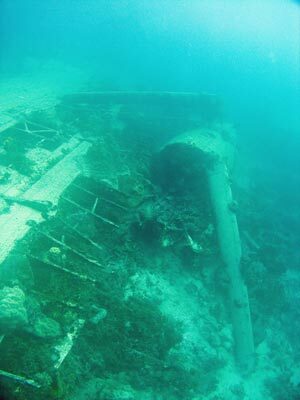 During research to update these web pages, I have corresponded with Raymond Holyoak (who was writing his thesis on the defence of Townsville during WWII) by email about a plane I had dived on in the Solomon Islands in 1992. 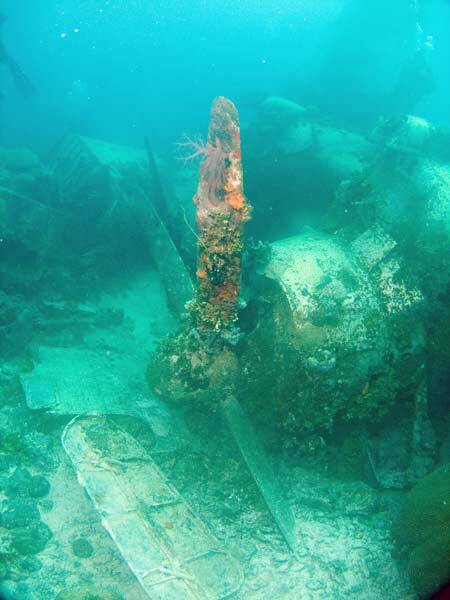 This was alleged by the dive operator to be an Emily. I provided him with copies of some photographs I took on my 1992 trip. Mr Holyoak has advised me (and this confirmed something that I had suspected) that the plane in the Solomons at Ghavutu is in fact, not an Emily but a Kawanishi "Mavis". See the "Mavis" for more details. From the damage, it appears that the plane was not attacked as there is no bullet damage visible but the cockpit may have been hit as it is so badly damaged this cannot be clarified. In addition, the wings may have been hit from above and this damage cannot be seen as the wings are upsidedown. Klaus Lindemann in his book Hailstorm over... (see references), says that it was returning to Chuuk when it was attacked by US fighters and hit. He says that it landed heavily but up the right way and sank soon after due to the bullet damage. I do not accept this explanation for the reasons outlined above. It appears to me that the plane was running low on fuel as only the inner engines were running when the plane hit the water (this can be ascertained as the tips of the propeller blades of the outer engines are not bent, showing that the engines were not running - see later about inner engines). The plane landed very heavily for some reason, so much so that it immediately flipped over its nose, with possibly the nose section breaking off. The remainder of the plane then went along upside down. This hypothesis has credence as all parts are upsidedown and further, the two inner engines (the ones most likely to be kept running if fuel was low) were running when the plane hit the water and as such, it is possible to tell the direction of travel of the plane at that time. This is because if an aircraft's engines are running when it crashes, afterwards the tips of the propeller blades of the running engines are ALL bent by contact with the water/land. The strange thing is that the tips of these two inner engines are bent forward, not backward as one normally sees. The port engine props are badly bent but the starboard engine props are only very slightly bent. This confirms that the plane was travelling backwards at the time the props hit the water. 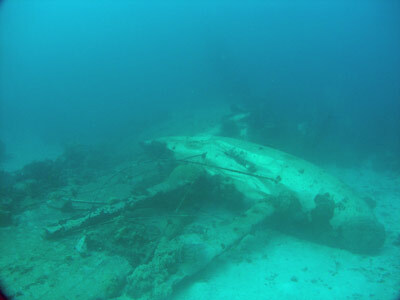 As it is physically impossible for the props to be bent forward or even touch the water any other way if the plane is travelling forward, then the plane must have been upside down and travelling backwards at the time the props hit the water. The only real way this could occur is for the plane to flip over the nose and run backwards along the water. 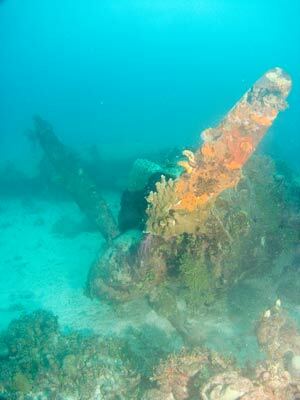 I suspect that the impact broke the back of the plane in a number of places and as the plane sank, it broke up into the four pieces found today. Today the wreck of the Emily is located at GPS Reading N7° 21' 20.9" E151° 52' 22.9" using WGS84 as the datum. This will put you right on the nose of the wreck. 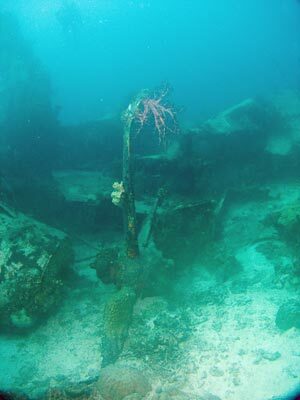 As you descend you should be able to see virtually the whole wreck from a few metres under the surface. 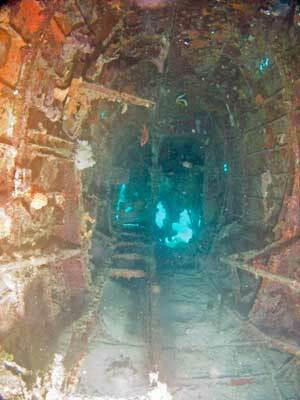 As mentioned, it is only 16 metres deep here, so you will get a good bottom time, although you only need to do about 20 to 25 minutes to fully see the wreck. The front section of the plane can be entered, but not too far as there is a great tangle of wires and other pieces blocking the way. If you look at the nose section you will see a number of windows, some of which are covered in growth. You may think that these are the cockpit windows but you would be wrong. They are actually windows on the bottom of the hull behind the nose. I presume that these were used for bomb sighting and perhaps aerial photography. Behind this the wing section is intact. As it is upsidedown, the engines as you look at them are the opposite of what is reality. All four engines have fallen off their mounts, but as the wing is so close to the bottom, you may not actually realise this. The outer port engine is resting on the sand and the prop is still attached to the engine. Two blades are fully clear of the sand and they are straight. The inner port engine is also on the sand and the whole propeller has detached from the engine. it has two blades fully clear of the sand. At least two of the blades have their tips bent forwards. The inner starboard engine is resting hard up against the forward section of the fuselage. Only one blade is fully visible and the tip of the one visible blade has a very slight bend forward. The outer starboard engine is also resting on the sand and has two blades fully clear of the sand. These blades are straight. 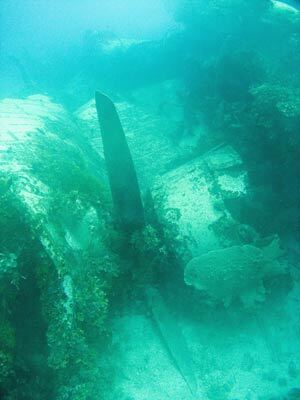 Therefore, the condition of the blades imply that both the inner engines were running when the plane hit the water, that it was moving backwards and that the starboard engine may have not been running fast when the prop hit the water. The main hull section is accessible via the rear part but there is not much to be seen. This is because you are in the lower deck of the plane. You can look into the upper section through a small door. The rear tail section is quite open and can be entered. You can swim almost to the gun turret. If you go to the rear of this section of fuselage, you can see the gun turret. One barrel of the machine gun is just visible above the sand. Part of the cockpit's dashboard is lying on the sand behind the wing. You can still see the dials and knobs on it and read the writing on them. There are some other pieces around the wreck, including huge batteries. 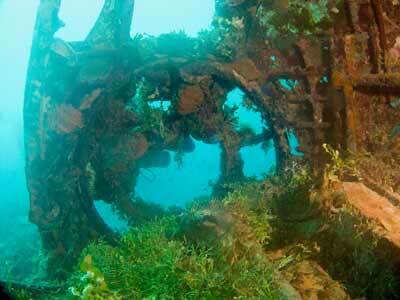 As per the "Betty" bomber wreck, I would not give up a dive on one of the shipwrecks in Chuuk. However, if you have done all the shallower wrecks, it is worth doing. The land based operators do this as a "plane double", where your first dive is on a shipwreck and your second dive is on the Betty Bomber and the third (using the remaining air from the second dive) on the Emily. You will have more than enough air to do both on one tank. Maximum depth is about 16 metres and a bottom time of 20 to 25 minutes is sufficient to see it completely. Video taken 14 November 1997. Another video shot by Kelly McFadyen on our 2011 trip to Chuuk.